It was a busy publication year for the WMU children’s literature program’s faculty. Professor Gwen Athene Tarbox had two chapters appear in edited collections: “Violence and the Tableau Vivant Effect in the Clear Line Comics of Hergé and Gene Luen Yang” in The Comics of Hergé: When the Lines Are Not So Clear edited by Joe Sutliff Sanders, and “From Who-ville to Hereville: Integrating Graphic Novels into an Undergraduate Children’s Literature Course” in Graphic Novels for Children and Young Adults: A Collection of Critical Essays, a volume that she co-edited with Michelle Ann Abate (University of Press of Mississippi, 2017). Professor Meghann Meeusen’s essay, “The Difficulty in Deciphering the ‘Dreams That You Dare to Dream’: Adaptive Dissonance in Wizard of Oz Films,” was published in volume 42.2 of the Children’s Literature Association Quarterly. Dr. Meeusen also had a chapter, “Framing Agency: Comics Adaptations of Coraline and City of Ember” appear in Graphic Novels for Children and Young Adults: A Collection of Critical Essays, edited by Michelle Ann Abate and Gwen Athene Tarbox. On March 17, 2017, Krystal Howard defended her dissertation, “The Collage Effect: Form and Participatory Reading in Contemporary Children’s and Young Adult Literature.” In attendance were her director, Dr. Gwen Athene Tarbox, committee members Dr. Meghann Meeusen and Dr. Elizabeth Bradburn, Graduate Advisor Steve Feffer, and Krystal’s husband, Tom Howard. Krystal’s outside reader, Dr. Mike Cadden, joined the group via Skype from his office at Missouri Western State University, where he serves as the Director of the Children’s Literature Program. In addition to passing her defense, Dr. Howard had other wonderful news: she has accepted a tenure-track position in liberal studies and children’s literature at California State University-Northridge. Congratulations, Krystal, from everyone in the Department of English at WMU! Poster Presentations in Dr. Meeusen’s graduate level children’s literature course: Children’s Literature: Image and Theory. In Spring 2017, Dr. Meeusen taught a course rich in critical theory, visual theory, and children’s literature. On the penultimate class day, students gave poster presentations on key works in multicultural children’s picture books. Check out the course description and the images below! Check out the long-form poster below for information on a course that Gwen Tarbox will offer this summer. Registration information is included. Sign up beginning February 8, 2016! Advanced study of children’s literature acknowledges the complexity of the field by applying critical and theoretical approaches to books and other media for young people. To facilitate this study, ENGL 5820 utilizes both works of fiction and critical readings from WMU’s Children’s Literature Comprehensive Examination Reading List to offer the opportunity for an in-depth study at children’s and young adult literature. Because of the wide range of both the comprehensive exam list and field of children’s literature, ENGL 5820 also offers students a more specific topic of study that acts as an anchor for class discussion. Of the forty core texts on WMU’s Children’s Literature Comprehensive Examination Reading List, thirty of these include either a visual component or have inspired an adaptation in a visual medium. Thus, the Spring 2017 section of ENGL 5820: Studies in Children’s Literature will focus on “Theory & Visual Transformation.” After reading selections from critical texts, students will apply this theoretical foundation to examples of children’s fiction as well as their visual adaptations. By examining how the same theories can be interpreted differently when interrogating the new visual meaning, students will not only engage a wide variety of critical approaches, but also develop a richly analytical foundation in critical thinking. Youth Poet Naomi Shihab Nye Comes to Kalamazoo! The Kalamazoo Public Library and Western Michigan University will bring Poet Naomi Shihab Nye to the annual Youth Literature Seminar on November 18, 2016! Check out this great conference opportunity here! Children’s Literature Association 2016 – WMU Represents! At the annual ChLA conference, held this year in Columbus, Ohio, a number of present and past WMU children’s literature program students and faculty got together to give papers, get lots of great ideas, and celebrate our program. Dr. Tarbox’s birthday fell during the conference, and she enjoyed blowing out an appropriately small number of candles along with, among others, WMU alum Dr. Gabrielle Atwood Halko, associate professor of children’s literature at West Chester University! Meeting author Gene Luen Yang was a highlight for everyone, and it was great to catch up with folks who had Michigan children’s literature connections beyond our program, including Dr. Laura Jimenez of Boston University, who did her doctoral work at MSU, Dr. Ramona Caponegro, an associate professor at EMU, Dr. Nicole Wilson, a faculty member at Wayne State University, and Gina Boldman, faculty at EMU. A true highlight was when Krystal Howard received an award for the best doctoral essay on children’s literature! We are all so proud of her. She and Jason Vanfosson gave amazing presentations, and a good time was had by all! Enrollment Begins Soon for ENGL 5830! WMU doctoral candidate Krystal Howard has a new blog, The Verse Novel Review, that promises to become a go-to resource for teachers, students, and general readers of the verse novel form. Her first review, published this month, focuses on Kwame Alexander’s award-winning The Crossover. In addition to these detailed reviews, Krystal provides a bibliography, a resources link page, and a discussion of the verse novel form. Bookmark her page, as it will update frequently. Congratulations, Krystal! “Mirrors & Windows” is Kalamazoo Public Library’s 38th annual Mary Calletto Rife Youth Literature Seminar. This year’s seminar features award-winning author Jacqueline Woodson, award-winning educator Kathleen T. Horning, and critically acclaimed author Jason Reynolds. See the full seminar schedule. Jacqueline Woodson is the winner of the Margaret A. Edwards Award for lifetime achievement in writing for young adults, the recipient of three Newbery Honors for After Tupac & D Foster, Feathers, and Show Way, and a two-time Finalist for the National Book Award for Locomotion and Hush. Other awards include the Coretta Scott King Award and Los Angeles Times Book Prize for Miracle’s Boys. Woodson’s Brown Girl Dreaming is the 2014 National Book Award Winner for Young People’s Literature, 2015 Coretta Scott King Author Book Award Winner, 2015 Newbery Honor Book, 2015 Sibert Honor Book, 2015 Boston Globe–Horn Book Nonfiction Honor Book, and 2015 E.B. White Read Aloud Award Winner for Middle Readers. Her most recent books are her novel Beneath a Meth Moon and her picture books Each Kindness and This Is the Rope. Jason Reynolds is the author of critically acclaimed When I Was the Greatest, for which he was the recipient of the Coretta Scott King/John Steptoe Award for New Talent, and Boy in the Black Suit. You can find his ramblings at JasonWritesBooks.com. An expert on graphic novels and comics will help put Western Michigan University’s 2015-16 common-read book in perspective when she presents a public talk at 8 p.m. Wednesday, Oct. 14, in the Bernhard Center’s South Ballroom. Chute is associate editor of MetaMaus, a behind-the-scenes book about the creation of Maus by Art Spiegelman. This text explores the making of what Chute calls Spiegelman’s “terrain-shifting” Maus graphic narrative, a narrative that in 1992 became the first graphic novel to win a Pulitzer Prize. Chute’s first book, Graphic Women, is a scholarly treatment of the work of female cartoonists Aline Kominsky-Crumb, Phoebe Gloeckner, Lynda Barry, Marjane Satrapi, and Alison Bechdel. In conjunction with this year’s common read and related First-Year Experience activities, WMU has launched a campuswide comics project called Making History. WMU students with varying levels of artistic ability—from none to considerable—are engaging in Spiegelman’s process of interview, transcription and comics creation to produce short nonfiction narratives. Those who submit their comics by Dec. 15 will have their work included in a published collection as well as have a chance to win prizes. For more information about the Making History Project, click here. Bookbug is Kalamazoo’s independent bookstore committed to curating, discussing and celebrating new books and hosting preferred events. 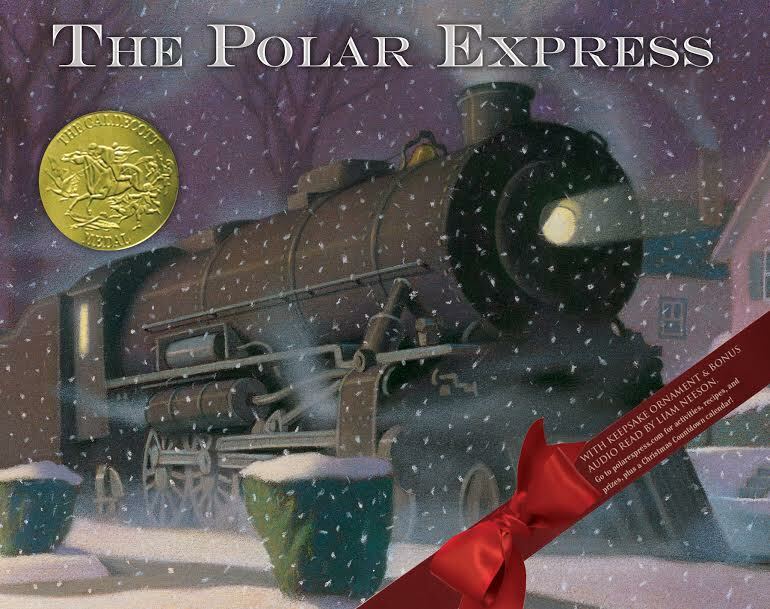 Join in celebrating Chris Van Allsburg’s release of the 30th Anniversary of the Polar Express on Sunday, November 15 at 2pm at The WMU Little Theater! Each ticket is good for a single entry and includes a copy of The Polar Express 30th Anniversary Edition, which will be distributed at the event. 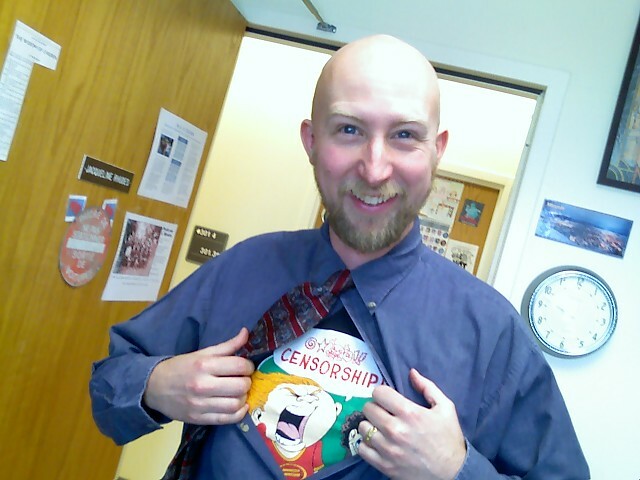 Every month, Dr. Tarbox co-hosts a podcast on comics for young readers with Dr. Andy Wolverton, a librarian in Maryland. Together, they discuss one book for teens and one book for younger kids, as well as interviewing comics creators and scholars. You can click on the link on the link to listen to Dr. Tarbox’s shows at the Comics Alternative, where the Two Guys With PhDs, Derek Royal and Andy Kunka, have made the podcast a reality! The theme for ChLA 2016 is “Animation.” This concept reflects new developments in both the aesthetic creation and the critical analysis of children’s and YA literature. The idea of “Animation” has a special significance for OSU, given the campus’ well-known comics collection and cartoon museum, its Wexner Center for the Arts, and its Advanced Computing Center for Art and Design (ACCAD). Moreover, we feel that the theme “Animation”— defined variously as “inspiration, vivacity and liveliness” as well as “continuous motion or shape change”—will inspire a wide variety of possible paper topics. 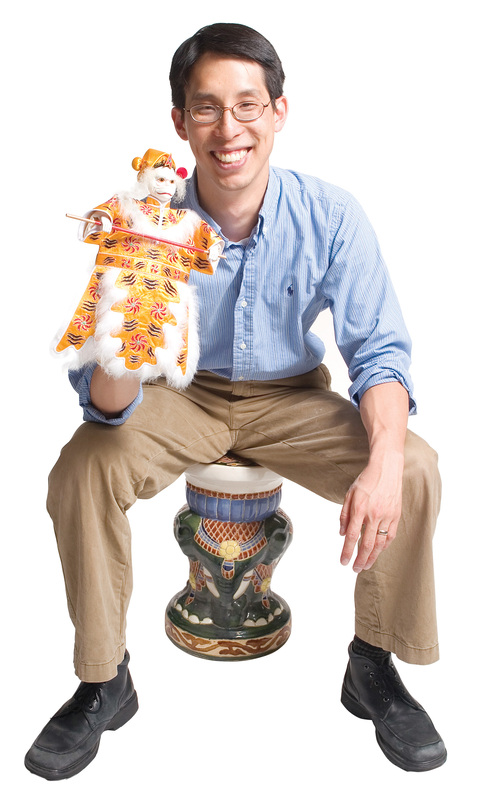 The conference organizers are pleased to announce that Gene Luen Yang will be a featured speaker. He will be giving a talk and book signing on the evening of Thursday, June 9! Gene Luen Yang began drawing comic books in the fifth grade. In 1997, he received a Xeric Grant for Gordon Yamamoto and the King of the Geeks, his first comics work. He has since written and drawn a number of titles, includingDuncan’s Kingdom, The Rosary Comic Book, Prime Baby and Animal Crackers.American Born Chinese, his first graphic novel from First Second, was a National Book Award finalist, as well as the winner of the Printz Award and an Eisner Award. He also won an Eisner for The Eternal Smile, a collaboration with Derek Kirk Kim. Recently, he has been working on the comics series Avatar: The Last Airbender. Yang lives in the San Francisco Bay Area. 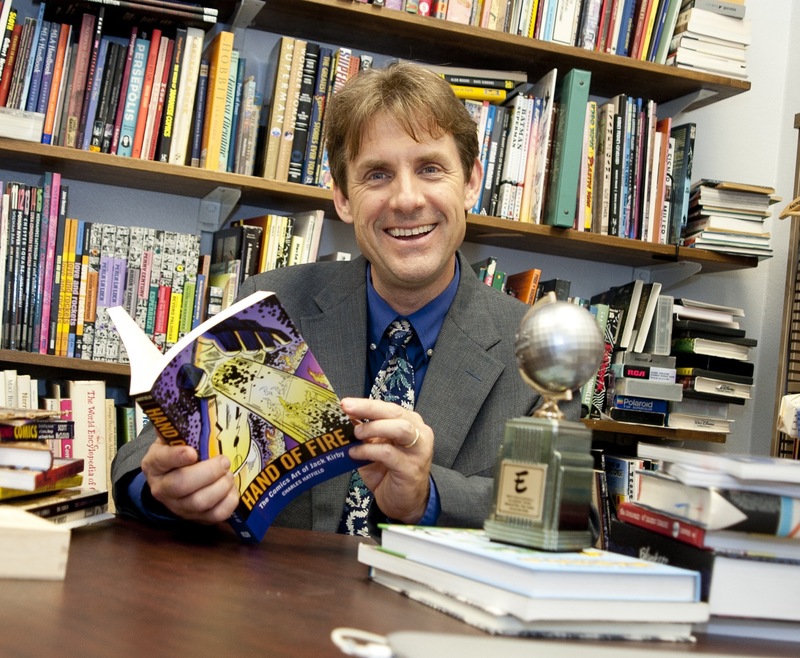 Charles Hatfield – Professor of English at California State University, Northridge, author of Alternative Comics (2005) and the Eisner Award-winning Hand of Fire: The Comics Art of Jack Kirby (2011) and co-editor of The Superhero Reader (2013). He has served on the boards of the International Comic Arts Forum (1997-2009) and MLA Discussion Group on Comics and Graphic Narratives (2010-2013). His essays on children’s comics have appeared in The Lion and the Unicorn, Children’s Literature Association Quarterly, Oxford Handbook of Children’s Literature (2011), and Keywords for Children’s Literature (NYU Press, 2011). Charles is currently curating a Kirby exhibition and co-editing The Cambridge Companion to Comics. Joe Sutliff Sanders – Associate Professor in the Children’s Literature track of the English Department at Kansas State University. He is the author of a book about classic orphan girl novels (Johns Hopkins UP, 2011) and the co-editor, with Jackie C. Horne, of a collection of essays about The Secret Garden (Scarecrow, 2011). In 2011, Joe received a fellowship from the National Endowment for the Humanities and in 2013 he was the Fulbright fellow to the University of Luxembourg. Joe is the editor of a collection of essays about the Belgian cartoonist Hergé (University Press of Mississippi, 2016) and the author of new and forthcoming essays on picture books, manga, digital comics, and the history of children’s comics. We Need Diverse Books™ is a grassroots organization of children’s book lovers that advocates essential changes in the publishing industry to produce and promote literature that reflects and honors the lives of all young people. For more information on the We Need Diverse Books movement, click here.